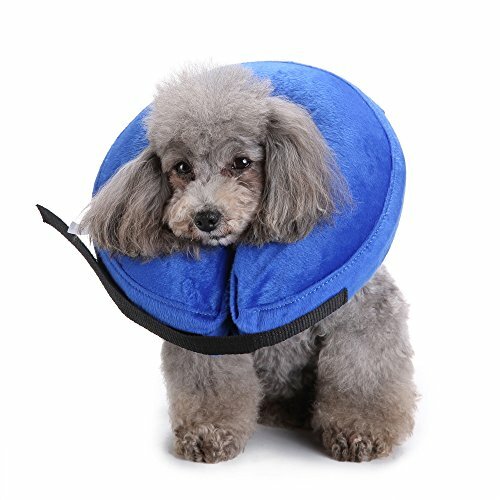 The recovery collar is a soft and comfortable inflatable collar, which is designed to prevent your pet from scratching or biting injured area. It does not interfere your pet's peripheral vision, they can eat, drink and sleep normally. And it would not mark or scrape furniture. Great for dogs and cats recovering from surgery and it's washable. When you do not use it, you can deflate it for storage. S: Neck Circumference 6-9"" M: Neck Circumference 8-12" L: Neck Circumference 12-18" How to use 1.Insert your pet's everyday collar through the inner ring loops of the collar. 2.Inflate the collar via air valve(pinch & blow). Please put the zipper together when inflates. Inflate until it feels full, but not hard. 3.Fasten everyday collar onto your pet and stick the strap that should be placed at the back of the neck then adjusted it for a perfect fit"
S: Neck Circumference 6-9" M: Neck Circumference 8-12" L: Neck Circumference 12-18" please kindly check the size details picture. View More In Recovery Collars & Cones. If you have any questions about this product by MDCT, contact us by completing and submitting the form below. If you are looking for a specif part number, please include it with your message. Dogline Post Surgery Cone/E-Collar, 17"-24"